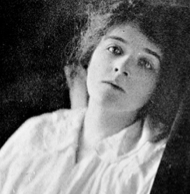 Hazel Hall was an American poet whose short life spanned the end of the 19th and the first two decades of the 20th centuries. She was born on the 7th February 1886 in Saint Paul, a Minnesota town that had been nominated some years earlier as the capital of the Minnesota territory. She was only a few years old though when the family moved to Portland, Oregon and Hazel would spend the rest of her life there. Her father was an important figure in the management of the Northern Pacific Railway. Tragedy struck at the age of twelve when an event would cause her to spend the rest of her life in a wheelchair. Some reports suggested that a serious bout of scarlet fever was to blame, while others suggested that a fall had been the cause of her disability. Whatever it was though, her education was seriously disrupted and she left school after the fifth grade. Despite that though she had a keen interest in poetry and devoured the books of Robert Frost, Edna St Vincent Millay and Emily Dickinson, amongst others, and she was determined to educate herself from home. She had already begun writing her own poems from the age of 9 and she continued this as her teenage years went by. In her disabled condition she was unable to go out to work so took up professional sewing as a means of earning some kind of income, not necessarily believing that she could make money as a writer at that time. She would usually station herself by a large window to stitch gowns and baby dresses for well to do clients, all the while being a keen observer of the world going by on the streets outside. In fact her volume of work includes pieces about sewing and what she saw from her window. She became a serious writer of poetry in her twenties but it was not until the year 1916 when she finally had something published. The Boston Evening Transcript was the first publication to take her work, followed by a nationally circulated, and quite controversial, New York magazine called The Masses. This had strong political views about a number of subjects, including conscription, and was shut down after only a few years. Hall’s poetry proved popular and she found other outlets such as The New Republic and Harper’s Magazine, amongst many others. Despite living such a short life she had two further collections published. These were Walkers and Cry of Time. She became a much-loved poet in her adopted home state of Oregon and, some years after her death, the Oregon Book Award for Poetry was jointly named after her and William Stafford, also from Oregon. Such was her impact on the state’s literary life that she was often referred to as the “Emily Dickinson of Oregon”. Hazel Hall died on the 11th May 1924 at the age of 38. Her life-long poor health finally got the better of her and she had fallen ill some weeks before her death, unable to recover.